WASHINGTON, DC, April 7, 2016 (ENS) – U.S. conservation groups are petitioning the federal government to protect pink Taiwanese humpback dolphins under the Endangered Species Act to help prevent the extinction of a population that now numbers fewer than 75. “The Taiwanese humpback dolphin could vanish within our lifetimes if help doesn’t very come soon,” said Dr. Abel Valdivia, an ocean scientist with the Center for Biological Diversity, one of the petitioning groups. The petition calls for the U.S. National Marine Fisheries Service to encourage Taiwan to address pollution, illegal fishing, boat traffic and other threats these small dolphins face in the shallow waters along Taiwan’s densely populated west coast. 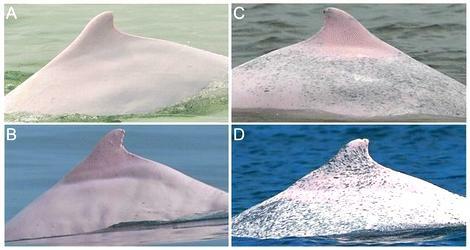 The Taiwanese humpback dolphin is unusual because its skin color changes from grey to pink or white as it matures. Dolphins from this subpopulation have pigmentation that differs consistently from that of nearby subpopulations along the coast of mainland China, according to the International Union for the Conservation of Nature’s Red List of Threatened species, which classifies this small dolphin as Critically Endangered. Numbers have fallen from 99 animals in 2002, when Wang first identified them, to about 75 today. 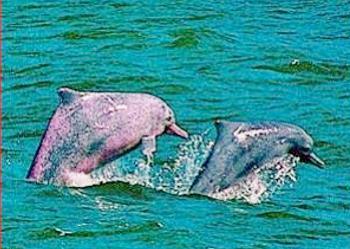 These pink dolphins occur only along a small stretch of coastal waters in and around the two main estuaries of western Taiwan, the Dadu and Joushuei rivers of Taichung, Changhua and Yunlin counties. “Given the number of development projects that are underway or proposed, and the fact that only minimal or no conservation measures are in place to reduce the probable impacts of the various threats (e.g., bycatch in net fisheries, severe reduction of freshwater flow to estuaries, land reclamation), a continuing decline in the subpopulation is projected,” the IUCN Red List states. In Taiwan conservationists have been protesting development in the limited range of these unique dolphins since 2009 with publications and demonstrations at government offices. In 2014 the National Marine Fisheries Service denied a previous petition to protect the Taiwanese humpback dolphin under the U.S. Endangered Species Act. The agency concluded that the population was not distinct from the Chinese white dolphin that swims in deeper waters closer to China’s coastline. But now, a study by Wang and colleagues published in 2015 concludes that the Taiwanese humpback dolphin is a distinct subspecies with unique characteristics whose numbers continue to decline. Called Matsu’s fish by Taiwanese fishermen, it is a biologically and culturally important subspecies of Indo-Pacific humpback dolphins, say the petitioning groups. “This small population of dolphins is in serious trouble,” said Dr. Naomi Rose, a marine mammal scientist with the Animal Welfare Institute, another petitioner. “Even though more than half of marine species may be at risk of extinction by 2100, only about six percent of species listed under the ESA are marine,” said Taylor Jones, endangered species advocate at WildEarth Guardians, the third petitioning group. “The Service needs to actively combat the current extinction crisis by quickly protecting species like the Taiwanese humpback dolphin,” said Jones. The petitioning groups say the U.S. Endangered Species Act is an effective safety net for imperiled species. Extinction has been prevented for more than 90 percent of plants and animals listed. Scientists estimate that 227 species would have gone extinct by 2006 if not for the act’s protections. Protecting species with global distributions can help focus U.S. resources toward enforcement of international regulations and recovery of the species.